Helmuth Rilling recorded numerous great oratorios over the decades. These recordings would often reach reference status thanks to outstanding young singers whose international careers he co-founded, assisting them in their later meteoric rise. His recording of Mozart's arrangement of Handel's Messiah is one of the most thrilling interpretations of this work. 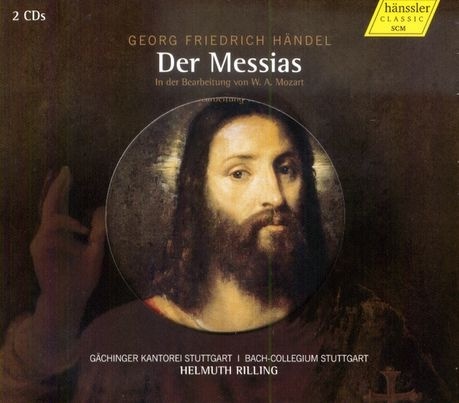 Georg Friedrich Händel's Messiah saw the light of day on April 13th, 1742 when it was premiered in Dublin, and is one of the most important oratorios ever written. Most famous is of course the ubiquitous "Hallelujah Chorus", that, legend has it, when first performed brought the audience to their feet, but the rest of oratorio is filled with catchy melodies and beautiful music, too. This CD is Mozart's edition of the work. Mozart reorchestrated Händel's score and revised several arias to adapt the work to the changing tastes of Viennese Classicism. A unique sound document of how Mozart's genius embraced his Baroque models, brilliantly interpretated by Helmuth Rilling!